〈…を〉(追いかけて)捕らえる，つかまえる 《★【類語】 catch は人・ものなどをつかまえる意の最も一般的な語; capture は抵抗・困難を排してつかまえる; trap はわなを用いて捕らえる》. He has been caught several times for speeding. 彼はスピード違反で数回つかまったことがある. The early bird catches the worm. ⇒early bird 1.
catch a rat in a trap ネズミ捕りでネズミをつかまえる. catch a ball ボールを捕らえる, 捕球する. catch a person's arm 人の腕をつかむ. 〔+目的語+by+名〕〈人の〉〔手足などを〕つかむ 《★3a の表現より一般的; ★【用法】 体の部分を表わす名詞の前に the を用いる》. catch a person by the arm 人の腕をつかむ. He caught me by the collar. 彼は私の襟もとをつかまえた. I caught the boy stealing fruit from our orchard. 少年が果樹園から果物を盗むところを見つけた. (You'll never) catch me doing that! 《口語》 そんなことをするものか. He was caught in the act. 彼は実際しているところを[現行犯で]見つかった. My boss caught me just as I was leaving the office. 私がオフィスを出て行こうとしていた時に上司がちょうど現われた. Her sleeve caught the coffee cup and knocked it to the floor. 彼女の服のそでにコーヒーカップが引っかかり床に落ちてしまった. She caught her coat on a hook. 彼女はコートをかぎに引っかけた. I caught my foot on a table leg and tripped. テーブルのあしに足を引っかけてよろめいた. He caught his fingers in the door. 彼はドアに手の指をはさんだ. Sorry I was late. I got caught in (the) traffic. 遅れてすみません. 交通渋滞に巻き込まれてしまったのです. Paper catches fire easily. 紙は燃えやすい. We got caught in a shower. にわか雨にあった. catch the enemy unawares 敵に不意打ちをくらわす. 〔+目的語+前置詞+名〕〈落下物・打撃などが〉〈人の〉〔体の一部に〕当たる 〔on，in〕《★【用法】 体の部分を表わす名詞の前に the を用いる》. A stone caught me on the nose. 石が私の鼻に当たった. The bullet caught the captain in the throat. その弾丸はキャプテンののどもとに命中した. I caught him one on the jaw.＝I caught him on the jaw with a punch. やつのあごに一発くらわせてやった. catch the 9:40 train [bus] 9時 40 分発の列車[バス]に間に合う. catch the mail [post] 郵便(集収時)に間に合う. Her beauty caught my eye. 彼女の美しさが私の目に留まった. The child tried to catch my attention. その子供は私の注意を引こうとした. catch a person's fancy 好みを引く, 好きになる. I couldn't catch the waiter's eye for some time. しばらく給仕の視線を捕らえることができなかった. I could not catch what he said. 彼の言ったことが聞きとれなかった. catch a glimpse of… …をちらりと見る. He caught the smell of something burning. 彼は何か焦げているにおいをかぎつけた. Her promise of a kiss caught him. キスしてやるという彼女の約束に彼は引っかかった. A drowning man will catch at a straw. 《諺》 おぼれる者はわらをもつかむ. catch at an opportunity 好機にとびつく. Did the lock [anchor] catch? 錠[いかり]はかかりましたか. My sleeve has caught on a nail. そでがくぎに引っかかった. The fire has caught. 火がついた. Dry kindling catches easily. 乾いたたきつけは火がつきやすい. It took several minutes before the engine caught. エンジンがかかるまで数分かかった. He made a fine [nice] catch. 彼は見事に捕球した. He missed the catch. 彼は捕球しそこなった. (get) a good [fine, large] catch (of fish) 大漁(をする). the catch of the door ドアの留め金. the catch on a suitcase スーツケースの留め金. He spoke with a little catch in his voice. 彼はのどをちょっと詰まらせて話した. There's a catch to this question. この問題には落とし穴がある. catches of a song 歌のところどころ. a catch line 人の注意を引くような宣伝文句, キャッチフレーズ. He plans to catch beetles for his collection. Catching fish is not for me! My dog can catch the Frisbee in his mouth. Jim can catch the ball much better with his new glove. She caught the baby before he fell. They caught the water in a kettle. He suddenly caught my arm. I hope they catch the thief soon. She caught the clerk taking money from the cash register. When the teacher called on me, I was caught napping. The disease can often be cured if caught early. She caught herself talking too much. Sorry, I didn't catch your first name. I didn't catch what time you said we should meet. I caught the first part of the speech but not all of it. He caught the train just in time. I must go. I have a plane to catch. He was not in time to catch the post yesterday. I caught him before he left his office. They caught the leak before the roof was ruined. I haven't caught the flu this year. He may have caught his cold from his friend. The house caught fire from faulty wiring. The fire soon caught the neighboring building. I caught my T‐shirt on a nail. He got his finger caught in the mousetrap. The glass caught the light and gleamed. When the sunlight caught the crystal, it flashed a rainbow of colors. He caught me a blow on the nose. The boxer caught his opponent on the jaw with his best punch. She turned up the radio to catch the weather forecast. He hurried home to catch his favorite TV program. The painting catches your imagination. Her hat certainly caught some attention. A red sign will catch your eye. I caught a glimpse of a smile on her face. He is so tall, so it's easy to catch sight of him. He caught a whiff of her perfume as she passed by. The briers always catch hold of my clothes. They played catch in the backyard. The fishermen bragged about their large catch. This sounds too good to be true _ there must be a catch in it. The catch is you must use your store credit card to get the discount. This bag was a good catch. The catch is broken on the cupboard door. My sleeve caught on a knob. His kite caught in a tree. The fire caught easily with the dry wood and old paper. The charcoal was wet and didn't catch. They put Larry in to catch. ((ことわざ))A drowning man will catch at a straw. She tried to catch at his coat to keep him from leaving. He won't catch at such an offer. The new fad didn't catch on with the teenagers. She is very quick to catch on to things. They caught her out by having someone spy on her. The company was caught out by the fall in prices. The runner was caught out at home base. As I had missed some classes, I had difficulty in catching up. Go on ahead. I'll catch you up later. I must catch up on answering my mail. This weekend I'm going to catch up on my sleep. We spent all night catching up on each other's life. Susan caught up with her friend by taking a short cut. He could easily catch up with his work. Your old habits are going to catch up with you. The police will catch up with you if you keep breaking the law. The chairman is caught between the two political parties. The girls got caught in the rain without an umbrella. They were caught up in a media frenzy. I found myself caught up in a scam. Harry got caught without his driver's license. You are going to catch it, when your mother finds out you skipped school. 成句Catch me later [some other time] ! She managed to catch the keys as they fell. From Middle English cacchen, from Anglo-Norman cachier, from Late Latin captiāre, present active infinitive of captiō, from Latin captō, frequentative of capiō. Akin to Modern French chasser (from Old French chacier) and Spanish cazar, and thus a doublet of chase. Displaced Middle English fangen ("to catch"; > Modern English fang (verb)), from 古期英語 fōn (“to seize, take”); Middle English lacchen ("to catch"; > Modern English latch), from 古期英語 læċċan. The verb became irregular, possibly under the influence of the semantically similar latch (from 古期英語 læċċan) whose past tense was lahte, lauhte, laught (古期英語 læhte) until becoming regularised in Modern English. Noah Webster's American Dictionary (1828) regards /kɛtʃ/ as the "popular or common pronunciation." It is labeled "not infreq[uent]" in Kenyon & Knott (1949). (countable) The act of seizing or capturing. syn. The catch of the perpetrator was the product of a year of police work. (countable) The act of catching an object in motion, especially a ball. syn. transl. The player made an impressive catch. (countable) The act of noticing, understanding or hearing. syn. transl. Good catch. I never would have remembered that. (uncountable) The game of catching a ball. transl. The kids love to play catch. (countable) A find, in particular a boyfriend or girlfriend or prospective spouse. syn. transl. Did you see his latest catch? (countable) Something which is captured or caught. transl. syn. The fishermen took pictures of their catch. The catch amounted to five tons of swordfish. (countable) A stopping mechanism, especially a clasp which stops something from opening. syn. transl. She installed a sturdy catch to keep her cabinets closed tight. (countable) A hesitation in voice, caused by strong emotion. There was a catch in his voice when he spoke his father's name. (countable, sometimes noun adjunct) A concealed difficulty, especially in a deal or negotiation. syn. transl. It sounds like a great idea, but what's the catch? Be careful, that's a catch question. (countable) A crick; a sudden muscle pain during unaccustomed positioning when the muscle is in use. I bent over to see under the table and got a catch in my side. (countable) A fragment of music or poetry. syn. "'Fair Enslaver!'" cried Mr. Enderby. "You must know 'Fair Enslaver:' there is not a sweeter catch than that. Come, Miss Ibbotson, begin; your sister will follow, and I—"
(obsolete) A state of readiness to capture or seize; an ambush. You lie at the catch again: this is not for edification. The common and the canon law […] lie at catch, and wait advantages one against another. (countable, agriculture) A crop which has germinated and begun to grow. There was a good catch of rye and a good fall growth. (obsolete) A type of strong boat, usually having two masts; a ketch. Fourteene miles Northward from the river Powhatan, is the river Pamaunke, which is navigable 60 or 70 myles, but with Catches and small Barkes 30 or 40 myles farther. (countable, music) A type of humorous round in which the voices gradually catch up with one another; usually sung by men and often having bawdy lyrics. Let us be jocund: will you troll the catch / You taught me but while-ere? One night, I remember, we sang a catch, written (words かつ music) by Orlo Williams, for three voices. (countable, music) The refrain; a line or lines of a song which are repeated from verse to verse. syn. The phrase repeated itself like the catch of a song. 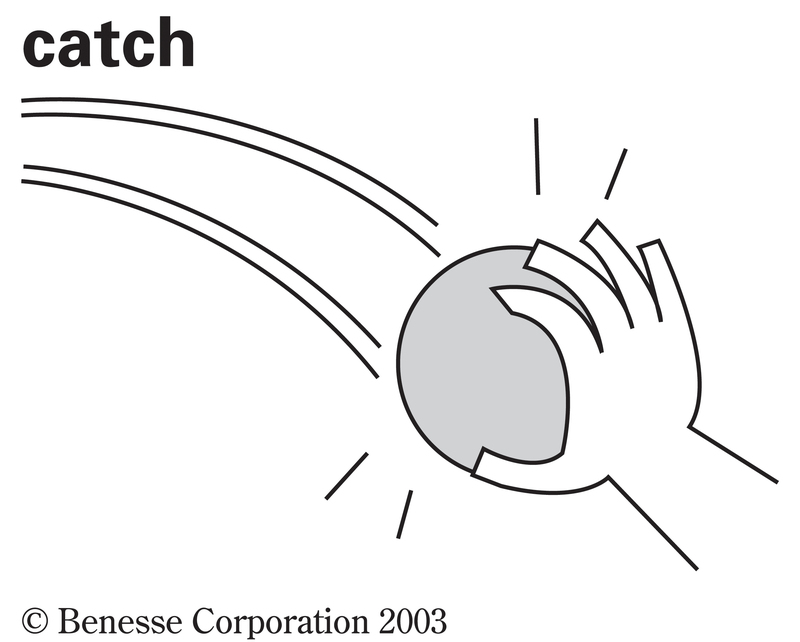 (countable, cricket, baseball) The act of catching a hit ball before it reaches the ground, resulting in an out. It was he who removed Peter Bowler with the help of a good catch at third slip. (countable, cricket) A player in respect of his catching ability; particularly one who catches well. […] in the field he is all activity, covers an immense amount of ground, and is a sure catch. (countable, rowing) The first contact of an oar with the water. They are sitting up straighter, breaking their arms at the catch and getting on a terrific amount of power at the catch with each stroke. (countable, phonetics) A stoppage of breath, resembling a slight cough. The glottal stop or glottal catch is the sound used in English in the informal words uh-huh 'yes' and uh-uh 'no'. It has been writ by catches with many intervals. We retain a catch of those pretty stories. I hope I catch a fish. He ran but we caught him at the exit. The police caught the robber at a nearby casino. (transitive, figuratively, dated) To marry or enter into a similar relationship with. The public […] said that Miss Bogardus was a suffragist because she had never caught a man; that she wanted something, but it wasn't the vote. As for Aspasia, concubinage with Pericles brought her as much honor as she could hope to claim in Athens. […] from the moment she caught her man, this influential, unconventional woman became a lightning rod […]. If he catches you on the chin, you'll be on the mat. The visitors started brightly and had an early chance when Valencia's experienced captain David Albeda gifted the ball to Fernando Torres, but the striker was caught by defender Adil Rami as he threatened to shoot. If you leave now you might catch him. I would love to have dinner but I have to catch a plane. Allen Gregory DeLongpre: Did anyone catch the Charlie Rose the evening before last. Did you catch it? No, nothing? He was caught on video robbing the bank. He was caught in the act of stealing a biscuit. After about a kilometer I caught a taxi to Santa Croce. Had Nancy got caught with a child? If so she would destroy her parent's dreams for her. (heading) To seize hold of. I caught her by the arm and turned her to face me. I have to stop for a moment and catch my breath. I caught some Z's on the train. My leg was caught in a tree-root. (intransitive) To be held back or impeded. Be careful your dress doesn't catch on that knob. His voice caught when he came to his father's name. (intransitive) To engage with some mechanism; to stick, to succeed in interacting with something or initiating some process. transl. Push it in until it catches. The engine finally caught and roared to life. (transitive) To have something be held back or impeded. I caught my heel on the threshold. He caught at the railing as he fell. The fire spread slowly until it caught the eaves of the barn. Stop gathering, in that gradual fashion, and catch the water sharply and decisively. The seeds caught and grew. (transitive, surfing) To contact a wave in such a way that one can ride it back to shore. If you are surfing a wave through the rocks, make sure you have a clear route before catching the wave. When the program catches an exception, this is recorded in the log file. I will throw you the ball, and you catch it. Watch me catch this raisin in my mouth. she internally resolved henceforward to catch every opportunity of eyeing the hair and of satisfying herself, […]. Townsend hit 29 before he was caught by Wilson. He caught the last three innings. (heading) To receive (by being in the way). You're going to catch a beating if they find out. The sunlight caught the leaves and the trees turned to gold. Her hair was caught by the light breeze. Everyone seems to be catching the flu this week. (intransitive) To spread by infection or similar means. Does the sedition catch from man to man? He accosted Mrs. Browne very civilly, told her his wife was very ill, and said he was sadly troubled to get a white woman to nurse her: "For," said he, "Mrs. Simpson has set it abroad that her fever is catching." The bucket catches water from the downspout. The trees caught quickly in the dry wind. the sails caught and filled, and the boat jumped to life beneath us. She finally caught the mood of the occasion. (transitive) To be hit by something. syn. He caught a bullet in the back of the head last year. (intransitive) To serve well or poorly for catching, especially for catching fish. The nets caught well, and Mr. Deeley reported it the best fishing ground he ever tried. Well, if you didn't catch this time, we'll have more fun trying again until you do. (heading) To take in with one's senses or intellect. Did you catch his name? Did you catch the way she looked at him? I have some free time tonight so I think I'll catch a movie. You've really caught his determination in this sketch. (heading) To seize attention, interest. No, a far more natural beauty caught him. He managed to catch her attention. The enormous scarf did catch my eye. The older past and passive participle catched is now nonstandard. Terms derived from the verb "to catch"
^ Noah Webster, An American Dictionary of the English Language, 1828. byu.edu.